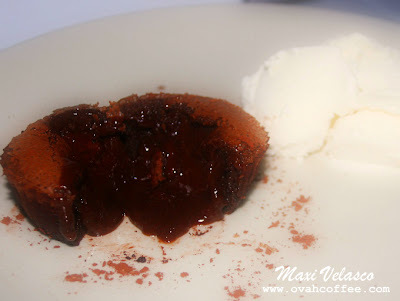 If you are craving for a chocolate dessert that will surely please your taste buds, go for piece of chocolate fondant. You'll never go wrong with this dessert. I watch the Master Chef Australia tv program everyday and have learned some important techniques on how to come up with a perfect chocolate fondant. I've tried baking this dessert myself before and have failed. I have to say that after following the advice taken from the program, my chocolate fondant's spot on! Cool! The oozing luscious melted dark chocolate in the middle of the cake is oh so delicious. Adding a scoop of vanilla ice cream on the side makes this dessert even more satisfying. Baking chocolate fondant doesn't require a ton of different ingredients and doesn't take a long time to prepare. All you need is a good recipe. Pair that with patience and you'll absoluty get the cake just right. I highly recommend Chef Ramsay's chocolate fondant recipe but you can always browse the internet for more choices. If you are unsure on what to do, go to YouTube and watch a video to give you an idea on how to make it. I paired my newly baked chocolate fondant with vanilla ice cream on the side and a cup of hot chocolate and wow ~~~ it was heaven! It is always nice to finally achieve success with a recipe and to enjoy it! so true, Carmen. I am so glad I've tried it!